Vaughan was born in 1923, and his acting career began way back in the mid-1950s. At the time of his passing he had over 220 credits to his name, but he’s perhaps best known today for his 11-episode stint on the HBO series Game of Thrones. 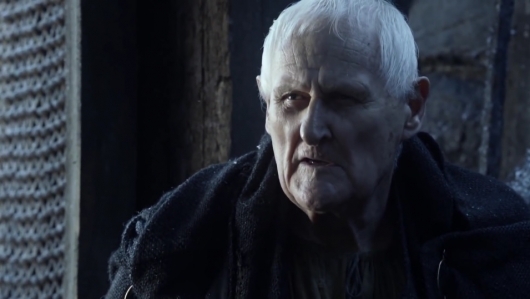 Vaughan played the elderly member of the Night’s Watch who offered wise words to characters like Jon Snow and Samwell Tarly, Maester Aemon Targaryen, great uncle to Daenerys Targaryen and great-great uncle, as fans recently discovered, to another popular character. Speaking of Game of Thrones, an interesting related fact courtesy of IMDb: Vaughan once voiced the Lord of the Rings character Denethor for a BBC radio production. Denethor was the father of Boromir, who was played by Vaughan’s co-star in season one of Thrones, Sean Bean, in Peter Jackson’s movie adaptation of J.R.R. Tolkien’s work. Other notable roles from Vaughan’s impressive career include Village of the Damned, Straw Dogs, Porridge, Brazil, Haunted Honeymoon, The Remains of the Day, The Crucible, Les Misérables (1998), An Ideal Husband, Death at a Funeral, and one from my childhood I had no idea about, Terry Gilliam’s Time Bandits, in which he played Winston the Ogre.